DollarClix Reviews – Legit or Scam? DollarClix.com is the online home of DollarClix, a company that says they are the number one paid survey community who has decided to take their successful service and make accessible as a mobile application. This website provides people with a mobile application where they will complete a variety of activities in exchange for points which are awarded to them, based on the activities they have completed. Perhaps the best part of this company and their service is that they offer their customers access to their mobile application and all its benefits completely free of charge at the time of download and throughout their time as a member. The DollarClix mobile application is actually a market research service. They get people to sign up and download their mobile application and then they will be provided with access to a variety of special offers and free trials. The more special offers and free trials that you sign up for through their service, the more you will be rewarded with points. These points will eventually add up and be converted into payouts through Bitcoin, Paypal, or Amazon. DollarClix is also especially enthusiastic about their referral program, which they refer to as a way to earn steady, reliable passive income, because their company says that whenever one of your referrals earns points, you will earn points as well. When it comes to earning money or rewards from a market research company, there are a few important questions to ask. The first is whether or not you can be a contributing member for free or whether they ask you to pay a fee. 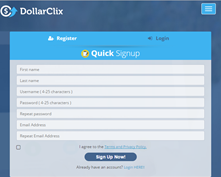 DollarClix is completely free to download and to join, so they meet this standard. Another important factor to consider is what the minimum payout is for their compensation or rewards. This company appears to use $5 as their standard minimum payout for most of the companies they payout to, and this isn’t an incredibly high threshold to reach. DollarClix does have a serious problem, however. It appears that most of their “market research” is actually done in the form of “special offers.” This is an issue because special offers generally mean free trials, and when free trials expire people are charged fees. Companies who put all their emphasis and focus on getting people to sign up for trials they don’t want or need and that will ultimately charge them fees higher than their rewards are not really ethical companies that benefit the members that are working with them. If you are someone who has worked with special offers and free trials before, and you feel that you could successfully manage the organization and scheduling that makes it possible to earn money from these opportunities without paying large numbers of fees, then you may still want to try this mobile app for yourself. But if you are new to this type of earning, it is probably better that you simply find a more straightforward market research company to work with. Average Rating for " DollarClix Reviews " is 1 out of 5 based on 1 reviews. Dollarclicks currently not paying members. they claim it's due to growing pains in the back of their PayPal account is now empty. They had promised to solve the issue by Monday however they have not. Currently they have over $150, 000 in unpaid cash-outs. I seriously doubt that they will be able to pay this anytime soon. I highly suspect that they are taking the money and planning on closing the site in favor of a secondary site they have opened.